South Quay DLR station – not actually on the guide I tried out. 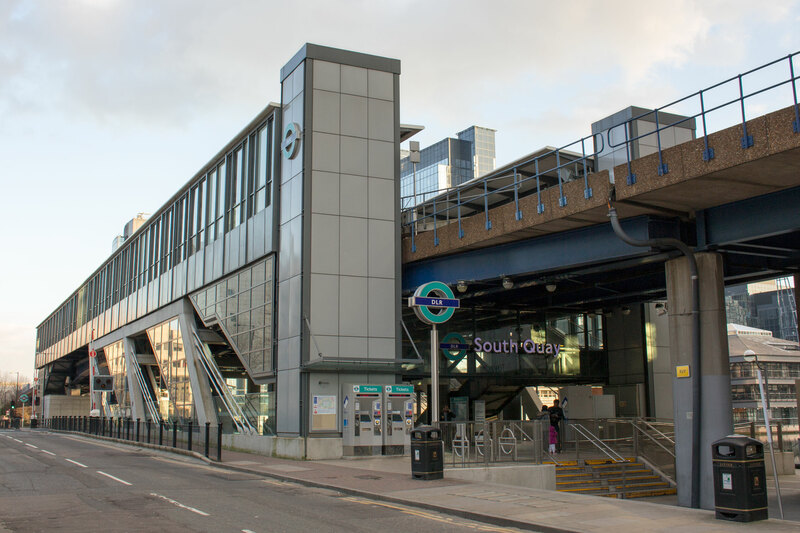 For those not aware, the Docklands Light Railway (DLR) is just what the name suggests — a light railway in London’s Docklands area (and beyond) — and a great way to get around. It passes through a lot of interesting places, and being elevated for much of its length, with only a few underground segments, it’s a good way to see them. So it’s a great idea that the DLR have produced some free audio guides to point out places and facts along the various routes. Actually I was kind of surprised these aren’t advertised better, I just happened to stumble on them through a mention on someone’s blog. Since I was visiting Canary Wharf yesterday anyway, I thought I’d skip the Jubilee line for a change and try out the Stratford to Canary Wharf guide (and the one in the opposite direction). So I downloaded the mp3’s, stuck them on my phone and set off. The outward journey was a bit of a mess. The DLR is fully automated and has remarkably consistent timings between and at stations, which is another reason why the guides should work so well (and there are occasional beeps to synchronise with leaving stations in case something gets out of whack). However having listened to the instruction track I was under the impression that I should start playing the guide only once the doors closed and the train was moving out of Stratford. It turns out there’s a short introduction at the start of each track too, which meant I ended up quite a way behind where I should have been making it hard to get synced up (and I had to skip quite a few bits). Still: after catching up again there were certainly some interesting facts (and one terrible pun). Coming back I was more prepared, listening to the intro in advance and then pausing at the correct spot before we set off, so the timing was much better. I even managed to bag a seat right at the front for the best view. It was slightly disappointing how much was just repeated from the opposite direction, but there were some different bits thrown in too. On the whole the guides themselves are informative, and the narration is very well done. There were certainly plenty of things that I wouldn’t have known, or even noticed, on the route. I did notice one minor mistake (something was described as being on the right, when it was clearly on the left) but that was no big deal. It would have been nice to have clearer instructions, or perhaps even bundle the files as an app. I’m usually against making apps for everything, but in this case it could also have the major improvement of splitting the guides more granularly so that one could start and end at any station, rather than having to travel the entire route (or struggle to find the correct starting point). I only found out today that there actually is a mobile site which allows one to stream the tracks starting from any station. But so far as I can tell it’s not even linked from the downloadable guides page, plus there are plenty of bits of the DLR where mobile coverage would be poor or non-existent. Not to mention the data charges it could rack up for those not on an unlimited package. Barring those improvements though, if you ever use the DLR I would recommend downloading them onto your phone/iPod to make your next journey a bit more interesting.